The office of the Philadelphia Convention and Visitors Bureau at 1601 Market Street. As major tech and creative companies trick out their offices with foosball tables and switch from conference rooms to collaboration corners, plain old cubicles have gone from acceptable office equipment to an eyesore at best and a talent-repeller at worst. While many have argued trendy open-plan systems are worse than their closed-off counterparts, one thing is clear: They do look pretty great. 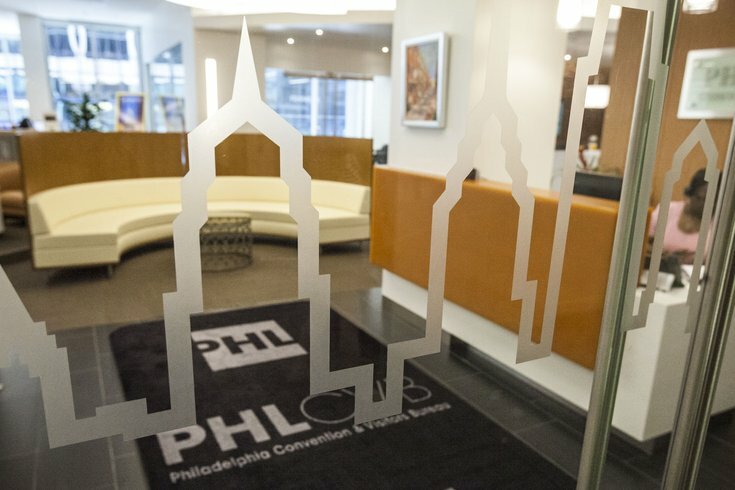 Philadelphia Convention and Visitors Bureau knows that, too. As essentially the official welcoming committee for Philadelphia, PHLCVB has to put its best foot forward. After all, Philly's still having trouble shedding our bad rap (thanks, Seth Meyers), and we could use all the extra cool points we can get. 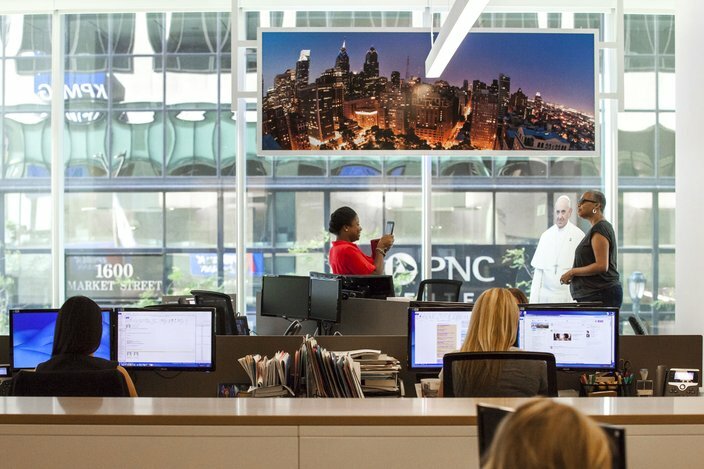 So earlier this year PHLCVB moved from its offices at 17th and Market streets to a brand-new space at 1601 Market St., hiring interior design firm NELSON to bring it to life. Prepare to get a little bit jealous. Doing away with the old closed-off offices and a labyrinthine cubicle setup, PHLCVB now has one of those fancy open plans. Everyone has bench seating - including the executive team - for increased transparency. 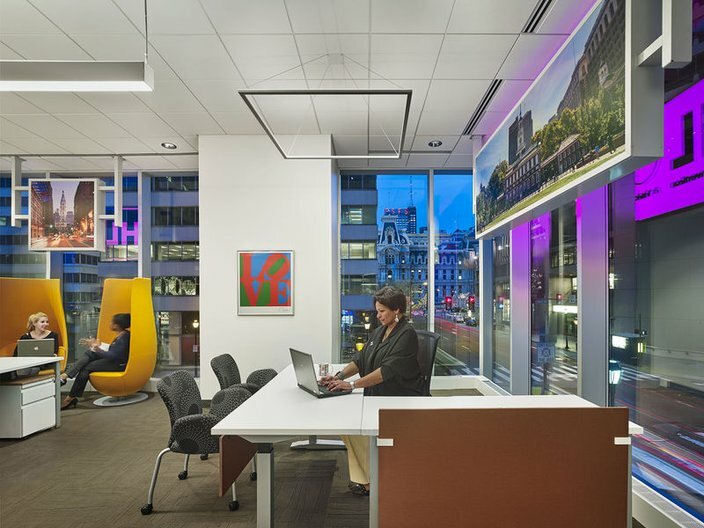 When workers need private time, they meet in smaller, closed spaces named after William Penn's town squares: Franklin, Rittenhouse, Logan and Washington. The entrance area hosts modern furniture and a sculptural chandelier, while the glass-walled multi-purpose room has an accompanying eating area to keep crumbs off the conference table. Punchy accent chairs and life-size cardboard cut-outs of Pope Francis (naturally) complete the space. But the finishing touch and crown jewel of PHLCVB's office is the brand-new mural that covers its west wall. Mural Arts commissioned the project and chose artist Marcus Balum to complete it. 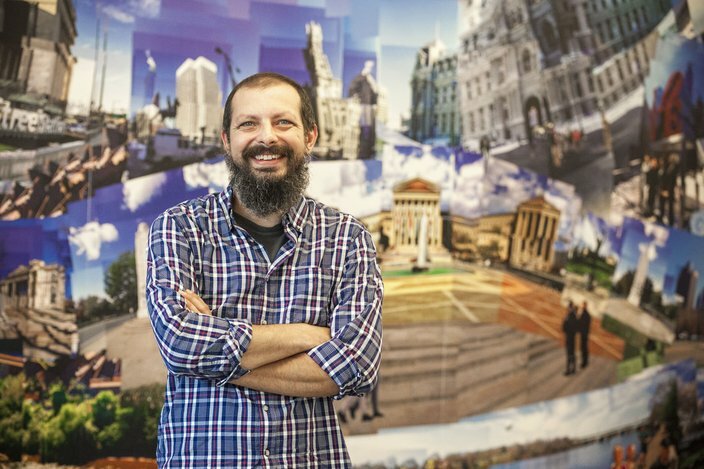 Called "The Energy and Vitality of Philadelphia," the mural is a collage of more than 3,000 photos, many of which Balum gathered from PHLCVB staffers, showing Philadelphia, its skyline and its most famous landmarks. Sourcing images in February and March, Balum headed out to some of the city's signature spaces himself to round out his collection. "It's always great to check out places you haven't seen in a while," he said. It took many hours working in Adobe Photoshop and InDesign, plus a new computer, to assemble the massive collage, Balum said. Independence Mall, City Hall, the Schuylkill River, the Philadelphia Museum of Art and the fireworks over Citizens Bank Park are all represented on the wall. 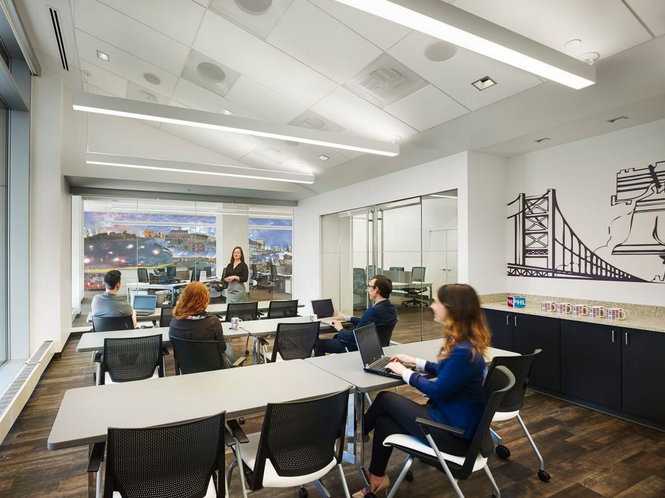 By using renderings, Balum even keenly added the upcoming Comcast Innovation and Technology Center to the mural's skyline, ensuring it won't be behind the times when the new structure goes up. The photos vary in size and resolution -- some are even from Instagram -- creating a painterly effect when they're all stacked together. Pockets of photos are arranged in kaleidoscopic mandalas, symbolizing the eye-catching, splashy aspects of Philly not otherwise present, like The Mummers. All in all, to those at PHLCVB, the mural must be a nice reminder of the city they're representing each day. 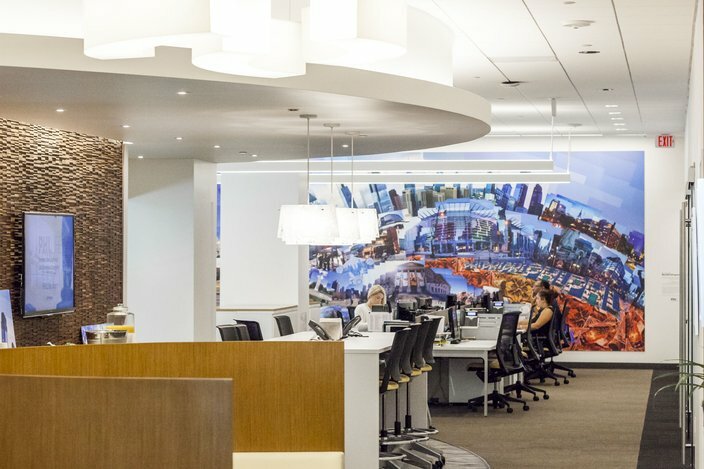 To everyone else, it's a reminder that they could use a mural in their office, too!